Viewed from its inception as likely to be the most charged moment of one of the Pope's major efforts at reform, next year's Special Edition of the Synod of Bishops for the Amazon region has taken a further stride toward being just that. 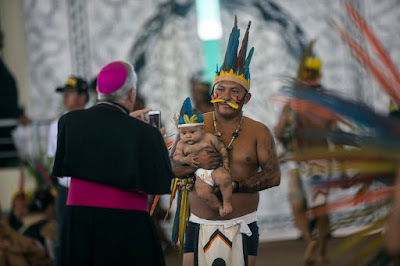 Echoing the phrases Francis employed last fall in announcing the October 2019 gathering, at Roman Noon Thursday the event's guiding theme – chosen by the pontiff – was revealed to be "Amazonia: New Paths for the Church and an Integral Ecology." Even more substantially, though, the release was accompanied by Francis' rollout of an 18-member Pre-Synodal Council – the event's preparatory group – comprised of prelates both from the trenches and heavy hitters on either side of the Atlantic. Among the latter are the Ghanaian Cardinal Peter Turkson – now head of the Curia's consolidated arm for social justice and the ongoing pointman on Laudato Si'; the Holy See's English-born "foreign minister" Archbishop Paul Gallagher, Papa Bergoglio's own successor as president of the Argentine bench, Bishop Oscar Ojea of San Isidro; and the freshly-installed head of Catholicism's largest diocese, Cardinal Carlos Aguiar of Mexico City. Just to be clear, as Mexico is far afield from the nine nations across which the Amazon forest spans, Aguiar's placement on this task-force is but the latest proof of his ever-rising role on the global stage. Still, having already committed himself to an extreme makeover of the capital church – some 9 million in its pews – "Don Carlos" doesn't lack for experience with the jungle to the south thanks to his days as secretary-general and president of CELAM, the regional mega-conference of the Latin American bishops. On a separate yet related note, having spent this week in Rome for his first tour since taking the reins in CDMX, don't be surprised to see Aguiar start pulling his weight north of the Rio Grande in due course. Conversant in English and amid an era that finds the life of the Stateside fold bound ever more to points south than east, the 68 year-old cardinal is the most US-savvy Arzobispo Primado in recent times – in the early 1970s, the future chief was one of the last students of the Montezuma Seminary, the Jesuit house near Las Vegas established to form Mexican priests outside the country due to the persecution of the local church. Even as the prep-team includes a layman and woman religious alongside the prelates (both a first for a Synodal Council of any kind), Francis' key pick to the group lay elsewhere – and came just as expected... at least, 'round these parts. 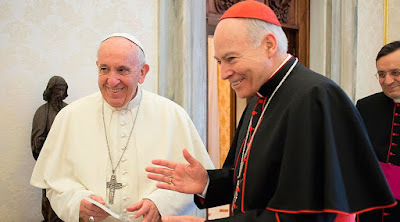 Nonetheless, the choice of Brazilian Cardinal Claudio Hummes for the lead seat of the Synod's prep-team brings to full circle a context a decade and more in the making. Now 83 and long relieved of the helm of the Congregation for the Clergy, while the Franciscan son of German immigrants has made the Amazon's future his focus since leaving Rome, Hummes is the first retired prelate to be given an institutional role in the planning of a Synod, let alone in a time when the assembly's significance and clout has been turbo-charged as never before. Here, some history bears recalling: two decades since the US bishops' election of Archbishop John Raphael Quinn as a mere delegate to the 1997 Synod for America was rejected by Rome, citing the San Francisco prelate's retired status – the moves on both sides arguably exacerbated by the recently-departed prelate's famously strong views – put simply, the world today is rather different. [D]espite being supposedly "retired," the Brazilian Cardinal Claudio Hummes OFM is certain to play a critical role in the preparations given his ongoing role as head of the Pan-Amazon Ecclesial Network, the multi-national coordinating body of the region's bishops, founded in 2014 at Francis' behest. While the group lacks the juridic standing of an episcopal conference per se, the void is more than compensated for by direct papal imprimatur: seated next to Cardinal Jorge Bergoglio by seniority at the 2013 Conclave, the former archbishop of Sao Paulo famously urged the Pope-to-be "Don't forget the poor!" as the votes piled up in his favor – a word that, as the the first American on Peter's Chair later admitted, would lead him to shatter even more precedent by taking the name Francis upon accepting his election. In a gesture that brought their closeness into the spotlight, the new pontiff upended yet another custom (remember: all this took place within the first 15 minutes) by plucking Hummes out from the Sistine Chapel rows to join him on the central balcony of St Peter's for his appearance before the world – a perk traditionally enjoyed solely by the senior cardinal from each of the College's three orders. Yet what made the moment even more extraordinary was its rich backstory: on his arrival in Rome in late 2006 as Benedict's choice to head the Congregation for the Clergy, Hummes was promptly slapped down within the Vatican for comments he made just before departing Brazil that, in terms of mandatory priestly celibacy, "the majority of the apostles were married," then punctuating the point by saying "the church has to observe these things... [and] advance with history." 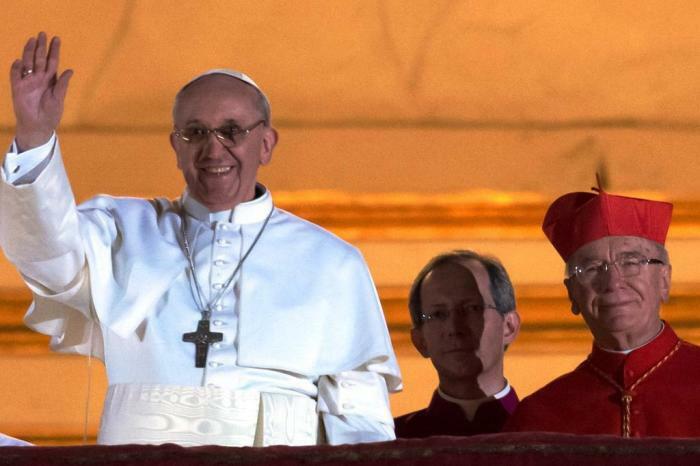 By bringing his "good friend" with him on his debut in white, Francis was sending a signal to the Curia he inherited – namely, that the Brazilian behind his shoulder was back at the center of things. As for what that means from here, with both Papa Bergoglio and Hummes stating since that the Amazon's church "must" have an "Amazonian face," with an "indigenous clergy" – and the region's unique culture and challenges having spurred calls from its bishops for the possibility of married priests – at first blush, the 2019 gathering has the prospect of being the most charged moment of Francis' push for an enhanced synodality in the church. ...and as another cardinal-elector likes to say, "To use a Catholic word, 'Bingo.'" Following the Synod's announcement, Kräutler (above) said his push on optional celibacy had even obtained Francis' support; according to the prelate, the pontiff encouraged him to collect "valid proposals" from the bishops. For his part, meanwhile, Hummes has largely kept circumspect on the high-octane angle – at least, explicitly so. 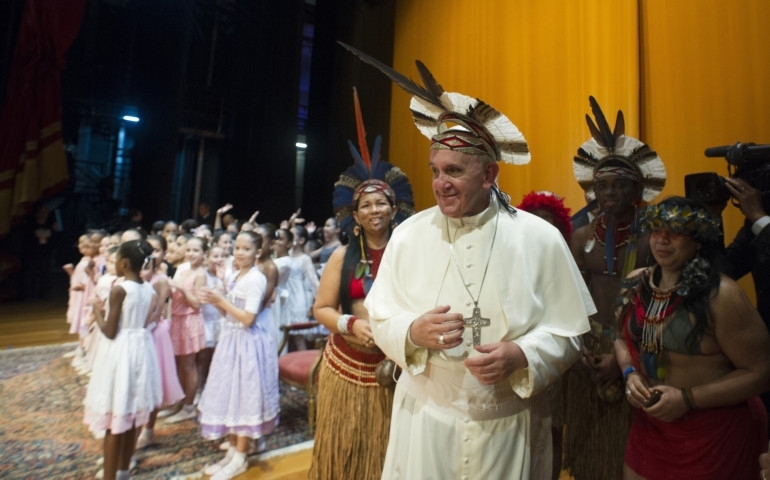 Speaking last week to the Italian religious news outlet AgenSIR, the cardinal said that, amid the Amazon's deepening shortage of ordained ministers, their presence "is essential for the evangelization of Amazonian peoples, especially indigenous peoples.... But they ask for priests with an encultured Christian message so that the church may become truly indigenous. Thus the Synod will certainly address this issue." Asked what the possible solutions to the crunch might look like, Hummes foresaw the gathering's since-announced theme, obliquely remarking that "The Pope said we should identify 'new paths.'" As it's ostensibly been forgotten in some quarters, in terms of priestly celibacy, recent history has seen a similar accommodation of a cultural phenomenon for the sake of souls – indeed, two of them: the Pastoral Provision chartered by John Paul II in 1980, then the Anglican Ordinariates established by Benedict XVI, both of which opened the Latin priesthood to married former clergy of Protestant communities (who, obviously, were received into the Catholic fold as laymen). That the recipients of both concessions aren't confined to remote forests, but serving well and clearly in the mainstream of ecclesial life across the English-speaking world shouldn't be lost on anyone, either; in other words, the door's already been cracked, then opened further, and all of it before this pontificate. The defence of the earth has no other purpose than the defence of life. We know of the suffering caused for some of you by emissions of hydrocarbons, which gravely threaten the lives of your families and contaminate your natural environment.... How can we fail to remember Saint Turibius, who stated with dismay in the Third Council of Lima “that not only in times past were great wrongs and acts of coercion done to these poor people, but in our own time many seek to do the same....” Sadly, five centuries later, these words remain timely. The prophetic words of those men of faith are the cry of this people, which is often silenced or not allowed to speak. That prophecy must remain alive in our Church, which will never stop pleading for the outcast and those who suffer. 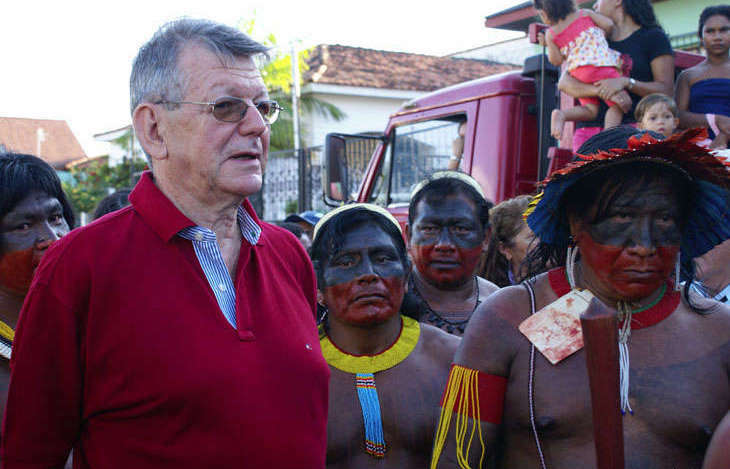 Dear brothers and sisters of Amazonia, how many missionaries, men and women, have devoted themselves to your peoples and defended your cultures! They did so inspired by the Gospel. Christ himself took flesh in a culture, the Jewish culture, and from it, he gave us himself as a source of newness for all peoples, in such a way that each, in its own deepest identity, feels itself affirmed in him. Do not yield to those attempts to uproot the Catholic faith from your peoples. Each culture and each worldview that receives the Gospel enriches the Church by showing a new aspect of Christ’s face. The Church is not alien to your problems and your lives, she does not want to be aloof from your way of life and organization. We need the native peoples to shape the culture of the local churches in Amazonia. And in this regard, it gave me great joy to hear that one of Laudato Si’s passages was read by a permanent deacon of your own culture. Help your bishops, and help your men and women missionaries, to be one with you, and in this way, by an inclusive dialogue, to shape a Church with an Amazonian face, a Church with a native face.